Galina Ustvolskaya (1919-2006) is becoming a cult figure in her native Russia and beyond. A person of intense humility, shyness and introspection, her music is the opposite: dramatic, often aggressive, with pounding rhythms that make it totally unique. �Any page of Ustvolskaya�s music is as recognisable as a Picasso brushstroke, and as deep in cultural and emotional resonance� (Andy Hamilton, International Piano). This recording contains her entire output for solo piano. 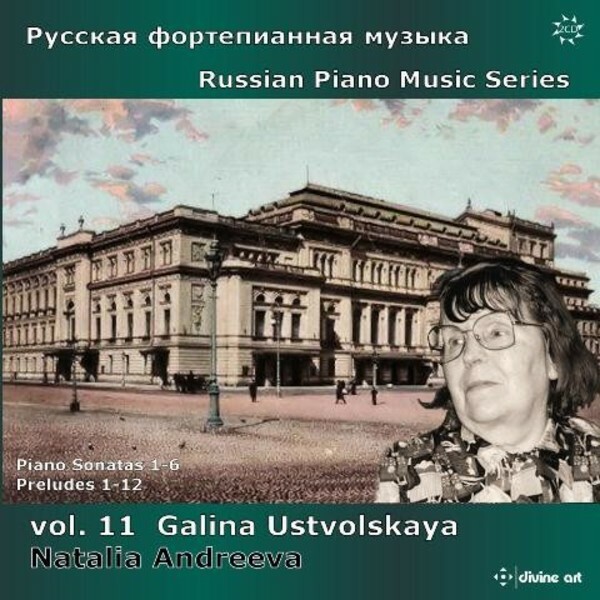 Russian pianist Natalia Andreeva has taken a special interest in the work of Ustvolskaya, beginning her �life-project� in Chicago in 2006, and her PhD thesis in Piano Performance was based on the interpretation of Ustvolskaya�s music � she remains in close touch with the composer�s widower and has developed a special affinity with this unique soundworld. Natalia currently works as Lecturer in Piano at the Sydney Conservatorium, Australia and regularly performs and broadcasts both there and in her native Russia.